What to focus on when running? You want to limit the amount of thinking you do on how you run while you run. Doing so will give you more mental stamina for running. Many runners who learn forefoot running may struggle with the mental aspect of learning a new running technique, and certainly, over-thinking how you run while you run can be distressing. Over-thinking uses more brain power, which is energetically draining. With that said, think about one thing at a time during running. Do this, and you’ll get great results and you’ll crush your training. Focusing on too many instructions on proper technique while running results in a flurry of neuronal activity that turns running into an unusually challenging task. The brain is very energy demanding which is why you want to essentially turn it off when running –the less you think, the less energy it eats up. Over thinking your mechanics, or too much internal focus of attention, impairs movement efficiency and increases energy consumption. Ultimately, concentrating on multiple things at once, especially when learning a new running style, leads to confusion and tension. This is known as paralysis by over-analysis. In my opinion, the only thing you should focus on is relaxing. Don’t worry about arm-swing, speed, torso rotation, shoulder rotation, and other technical stuff. Why? The brain functions as a serial processor, which means it can only process information one bit at a time. So, over-thinking your running mechanics while running will eventually lead to premature mental and physical fatigue. To avoid becoming overwhelmed and frustrated, allow yourself one thought related to mechanics when running. Chi Running and Pose Running also give great tips on aspects of your form you should focus on while running. In the meantime, see my Facebook page, where you’ll find all kinds of tips on forefoot running, barefoot running and minimalist running. 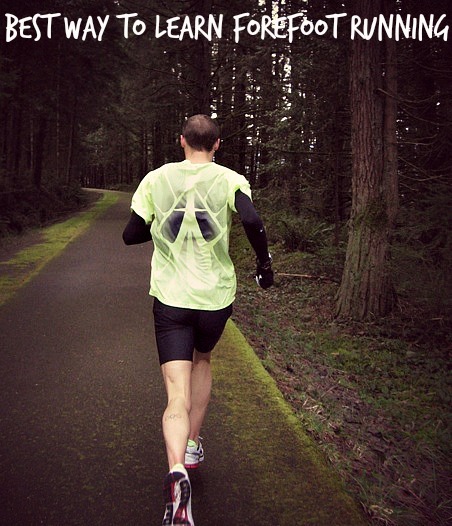 Run Forefoot Because You are Faster than You Think!